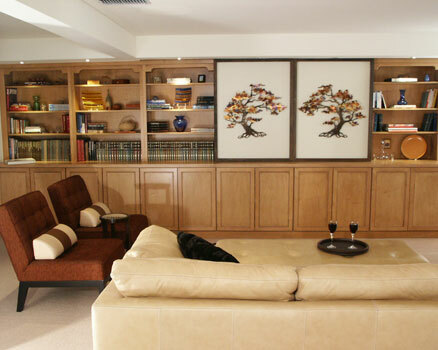 Split-Level House Update (Living/Dining Rooms) "AFTER"
The home owners wanted to create a place for a wide screen TV, concealed; as well as a place for their extensive book collection. We achieved this with custom cabinets, surround sound and new furniture, window treatments, carpet & area rug. A pair of custom framed panels display an original metal sculpture, that slides open to reveal the TV. The fireplace was surfaced with a large slab of marble to compliment the contemporary design. Recessed halogen lighting was installed in the ceiling in the living room area. The adjacent dining area also received new furniture, lighting and built-in cabinets for storage. The wall between the 2 rooms was perfect for the vinette created. New shear blinds were installed on the windows and sliding doors.